ENTRIES WILL BE ACCEPTED THE SUNDAY PRIOR TO THE FAIR DATES, FROM 1:00 PM UNTIL 2:00 PM. EXHIBITORS SHOULD PICK UP THEIR WORK ON SUNDAY AFTERNOON FOLLOWING THE CLOSE OF THE FAIR FROM 1:00 PM TO 3:00 PM. Any subject matter (two entries permitted). Section may be subdivided according to subject matter. Decorative Special Effects: acid etching, luster, enamel, raised paste, etc. Exhibitors may enter a maximum of two entries in any one class as long as each entry is different, e.g. in “Naturalistic” one could enter a tray and a vase with the same subject OR 2 vases with different subjects. A framed piece that consists of multiple pieces of china will be considered as one item and judged as a whole; the pieces in the framed piece should be like subject matter such as all naturalistic florals. For all entries, the primary focus is to be on painting and porcelain techniques (such as luster, structure, incising, gold work). Additional decoration which is not fired onto the entry is not to be the focus of the piece and is to be kept to a minimum. All entries must be of porcelain, except where glass is indicated; stoneware mugs will be accepted; all other will be disqualified. Decal work will also be disqualified. Entries must be the personal work of the exhibitor and must have a fired signature for competition. Where sets are entered, each piece must have fired signature. ‘Sets’ is considered as one entry and must be a set such as a tea set, etc., not just more of the same. No ‘Seminar’ pieces can be entered. Exhibitor’s signature must be neatly concealed for judging. Each entry must be securely fastened together. Any shape, any size; in all categories unless otherwise stated. Display stands will be furnished by the Guild. Entries can be entered only one time for competition and should have been painted within the last year. 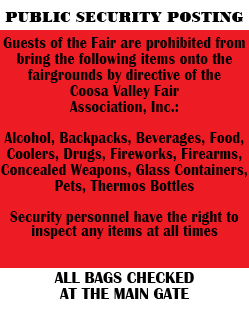 Every precaution will be taken to protect exhibits, but no responsibility will be assumed by The Coosa Valley Fair Association or the Porcelain Art Guild, Leona Clements Chapter, for damage or theft. If necessary, the Fair Chairman, designated by the Porcelain Art Guild, reserves the right to create a class (subclass) with the approval of The Coosa Valley Fair Association. Only judges, clerks, fair chairman and elected officers of the Porcelain Art Guild will be allowed in the exhibition area during acceptance of entries, judging and dismantling. The Clerk, if possible, will be the ‘Best in Show’ winner from the previous year since this Honoree will have a display of her work rather than entering the competition. THE EXHIBITOR IS RESPONSIBLE FOR DECIDING IN WHICH CLASS AN ENTRY IS TO BE ENTERED. ENTRIES WILL NOT BE CHANGED FROM THE CLASS THAT WAS SPECIFIED BY THE EXHIBITOR. All decisions of the judges will be final. If there is only one entry in a class or lot, that item must be judged. Judges have the right to award one or more Honorable Mention Awards. Best in Section will be awarded to each exhibitor in Sections II, III and IV scoring the highest number of points in any class of that section. ‘Best In Section’ is awarded a ribbon and $25. Best in Show Award will be selected from the “Best in Section” pieces and the first-place entries from Section V. “Best In Show’ is awarded a ribbon and $35. The 1st Place winner of the “Florals 10 in and over” will receive The Joyce Nolen Award ribbon. This award money ($35) going to the Porcelain Art Guild, Leona Clements Chapter. The 1st Place winner of the “Florals Under 10 in” will receive The Daisy Henderson Award ribbon. This award money ($35) going to the Porcelain Art Guild, Leona Clements Chapter. The subject matter for The Leona Clements Award for 2018 will be “Magnolias”. This award money ($35) going to the Porcelain Art Guild, Leona Clements Chapter. The subject matter for The Beth Powers Award for 2018 will be “Still Life”. This award money ($35) going to the Porcelain Art Guild, Leona Clements Chapter. The subject for The Revolving Award for 2018 was chosen by Larue Huckaby, the 2017 Winner of the ‘Best In Show’ Award. The subject will be “Glass”. This award is presented in honor of a person who has shown the greatest expertise of a particular technique of porcelain art. Honoree and subject will change annually as honors the “Best in Show” winner of the previous year’s fair exit and is selected by that artist. This award money ($35) going to the Porcelain Art Guild, Leona Clements Chapter.